Grilled pizza is all the rage these days, but for someone who has never attempted it, it may seem like more of a challenge than it actually is. The flavor is delicious, it is fast, and a person can cook enough pizzas for a large group in no time at all. So, here is an easy guide that can teach even the newest griller how to make a perfect grilled pizza. There is really no difference between making dough for grilled pizza, whether directly on the grill or on a stone, and making it for the oven. 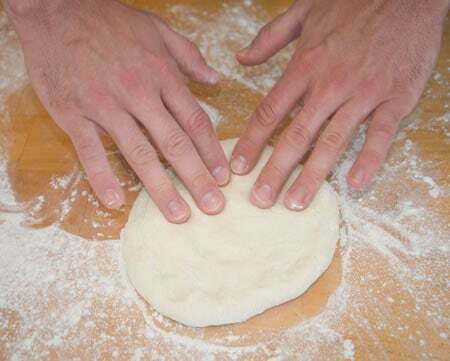 Typically, pizza dough must be made at least a day before grilling, so it has time to rise. There are two types of dough to make, and which one to use depends upon a person’s preference. The Neapolitan style of pizza dough is soft and pillowy, with bubbles that rise throughout when it is cooking. It only needs flour, salt, sugar, water, and some active dry yeast. It is easy to make, though it needs 18 hours to rise before use, and must be made a day ahead. The other type is the Roman style of pizza dough, which has a crunchier crust, is a bit firmer, and doesn’t bend beneath the weight of its toppings. This uses instant yeast, along with water, flour, salt and olive oil, and only needs an hour or two to rise, but 12-24 hours to rest, so it still can’t be made the day it is needed. The first thing to do is prepare the grill. If using a charcoal grill, move the coals so they are on one half of the grill, so there is an area that will still be warm, but where the crust will not be over direct heat. If a gas grill is used, leave one side off, and only turn on the other. The grill should be quite hot when cooking the pizza, so try to have the temperature at about 500 degrees when cooking begins. While the grill warms, get all the toppings organized, and place them on a tray that can be set right beside the grill, so they are close at hand when they are needed. Now it is time to roll out the dough. If planning on making multiple grilled pizzas, it is a good idea to roll them all out at once, and place them between sheets of parchment paper, so they can be grilled one after another. Keep them cool until ready to begin cooking, so there is no chance of them warming too much and sticking together. A light coating of oil on the side to be grilled first will help keep the dough from sticking to the grill, and also give it a crispy surface. Lay it across the grill and cook it for a couple of minutes, rotating it frequently to be sure it is cooking evenly. Bubbles may form on the top side, but this is normal, and will be flattened when the dough is flipped over, but if they get too large, poke them to release the air. 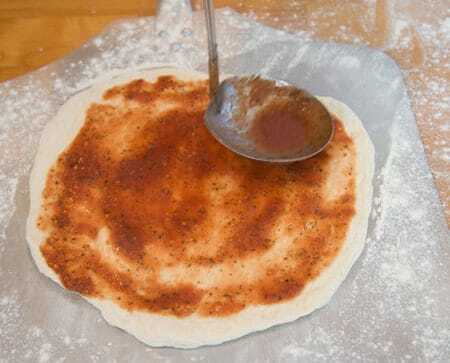 This is also the time to add a light coating of oil to the top side of the dough. Also, keep checking the bottom to be sure it is not burning. When the bottom is cooked, flip the dough over, and move it to the cooler side of the grill. Now is the time to add any cheese, sauce, and toppings, as quickly as possible. Then slide the pizza back over the heat, and cook it in the same fashion as the first side, turning it frequently, and peeking underneath to keep it from burning. When it is finished, slide it off the grill onto a pan and serve. When using a pizza stone to grill a pizza, there is a bit of difference in technique. The stone must be preheated before placing the pizza on it, or it will not cook properly. The pizza dough also gets the toppings before it is placed on the stone, as it will cook through without the need to flip it over. It must still be rotated to ensure even heating, but will cook a bit slower than one grilled right on the rack. The stone will get extremely hot, and also must be cooled down after cooking, which is easily done by leaving it on the grill after it is turned off. The grilled flavor is still present in the finished pizza, and best of all, there is no pizza mess to be cleaned off the rack. As with any pizza, meats that have not been smoked should be cooked before placing on the pizza. But what about veggies? Well, because grilled pizza is cooked so much quicker than those in an oven, it is also necessary to partially cook the veggies first, or they will still be raw when the pizza is finished. Of course, if they are sliced thinly enough, they could still be heated enough that pre-cooking them will not be necessary, but since the grill is on anyway, why not add a bit of flavor by popping the veggies in for a few minutes before adding them to the pizza? Having a good grill is most important, of course. The only difference between gas and charcoal is what a person prefers. For those that prefer not to cook on the rack, pizza stones are key. The Kit-Chef Round Cordierite Pizza Stone is highly rated, durable, can withstand heat up to 1000 degrees, and has a 14” surface, for large pizzas. 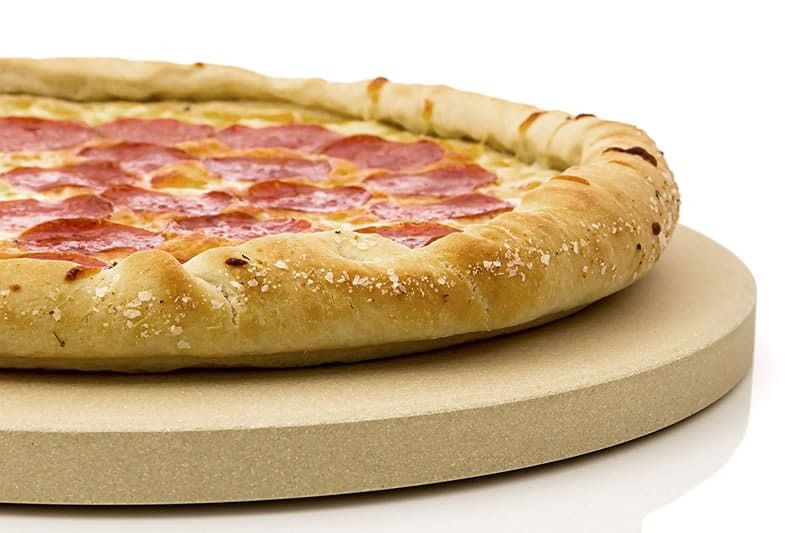 The Broil King pizza stone is 15” in diameter, and offers even heating and great insulation. 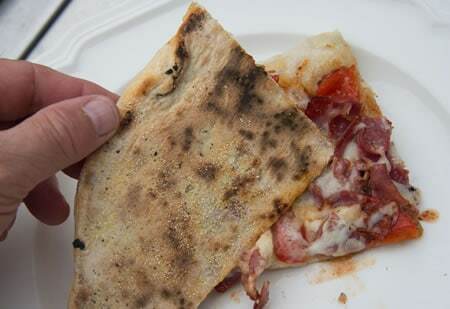 A pizza peel is also a good idea, for putting the pizza on the grill, or easily removing it when it is finished. A pair of tongs or a spatula can also be used in this way, though they are not as easy to use. A pan for serving, and a pizza cutter are also handy tools to keep around. Creativity is a must when cooking, and combining favorites is the best way to come up with new flavors. That’s how stuffed burgers began, and serving pie with ice cream became so common. It was only a matter of time before the ability to cook a pizza on a grill became part of the barbecue experience. But doing it right is not always so easy, which is why having the proper tools, and a few recipes to get started, is necessary for the perfect grilled pizza experience. 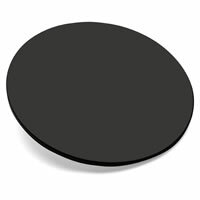 This durable cordierite pizza stone is coated in ceramic that has been specially formulated for use on the high heat of a grill, up to 1000 degrees. 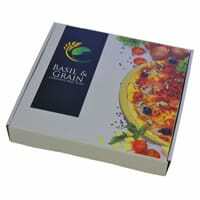 It retains the heat and distributes it evenly for a perfectly cooked crust every time. It is 14” wide, and ¾” thick. An eBook offering detailed cooking instructions and 2 delicious recipes are included. This cordierite stone is 13” in diameter, 3/8” thick, and is made to withstand extreme heat and cold. The ceramic glaze will not discolor from repeated use over the flames. When the pizza is cooked, the griller can cut it right on the stone and serve it to family or guests. And after the meal, it can be put into the dishwasher for easy cleaning. This stone is larger than most at 15”, which means larger pizzas can be cooked to feed more people. It is made of a ceramic composite that will resist cracking due to extreme temperatures, as well as damage from moisture. The ¾” stone offers even heating as well as better insulation for heat retention. This pizza cutter has a 13.8” stainless steel blade to slice through a thicker crust with ease, using a simple rocking motion. The handle is thermoplastic rubber, which provides a non-slip, cushioned grip. It is easy to use, and to clean, and is durable enough to last for years. When it is time to clean up, this sturdy tool makes it a breeze. It has an 18” handle with a rubber grip that is comfortable to use. The palm stalk bristles are safe to use on any cordierite pizza stone without fear of surface damage, unlike washing with dish soap. For sticky cheese messes, the steel scraper can be used to easily break it up. 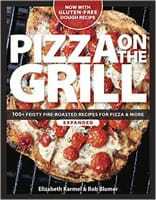 This pizza grilling cookbook includes over 100 tasty recipes, including 60 tasty pizza options.It also offers side and salad recipes, and even a few for drinks, all specially selected to complement each pizza. There are even substitution suggestions for the pickier pizza griller. And for those with gluten allergies, there are gluten-free recipes, including one for the dough. Grilling is such a big part of summer for so many people, but burgers and hot dogs can get boring, and even steaks or chicken can’t be eaten every day. The variety, and the delicious smoked flavor, of a grilled pizza, can break up the monotony, and because they are so quick and easy to make, these tasty meals may just take over the grill permanently.